President Donald Trump arrives to award the Medal of Honor posthumously to Air Force Tech. Sgt. John A. Chapman, for conspicuous gallantry during a ceremony in the East Room of the White House in Washington, Wednesday, Aug. 22, 2018. In South Jersey, Andy Kim tweeted about climate change. In the Lehigh Valley, Susan Wild touted an endorsement from former Vice President Joe Biden. And in Bucks County, Scott Wallace declared it a "bad day for Americans who had hoped for ethical government and drained swamps." The admission in federal court Tuesday by Michael Cohen, President Trump's longtime former lawyer, that Trump directed him to violate campaign-finance laws in 2016 delivered the biggest political blow yet to the White House. Tack on the criminal conviction of former Trump campaign chairman Paul Manafort and the indictment of a Republican congressman, and Tuesday was a low-water mark for Republicans. But even as talk of possible impeachment is ramping up in Washington, Democrats running in competitive districts, in the Philadelphia area and elsewhere, are avoiding that controversial word. Party leaders see an opening to brand Trump and his Republican allies in Congress as corrupt, but they are wary of overreaching and possibly alienating voters in swing districts with an explicit appeal to removing the president from office. To take control of the U.S. House, Democrats need a net gain of nearly two dozen seats. Some of the most competitive are in the Philadelphia metropolitan area. Some in the party's progressive base are demanding bolder action. Liberal billionaire Tom Steyer, who has spent tens of millions of dollars on an effort to impeach Trump, has reserved more advertising time in light of Tuesday's news. "We're going to do everything we can to make impeachment an issue in this campaign," said Kevin Mack, lead strategist for the Steyer group Need to Impeach. Kim, a former adviser to President Barack Obama who's running against GOP Rep. Tom MacArthur in New Jersey's Third District, "supports protecting" special counsel Robert Mueller's investigation, a spokesperson said in response to questions about impeachment. "Once we see the result of the Special Counsel's report, then we can discuss appropriate next steps," spokesperson Forrest Rilling said. A spokesperson for Wild, who is running against Republican Marty Nothstein for an open seat in Pennsylvania's Seventh District, an area previously represented by Republican Charlie Dent, didn't respond to a request for comment. Wallace, who is challenging Republican Rep. Brian Fitzpatrick in Pennsylvania's First District, said in a statement that it was "imperative for Congress to give" Mueller the tools to "complete his investigation unimpeded." The Wallace campaign on Tuesday started running Facebook ads pledging to be transparent in Congress and denouncing "the rampant corruption going on in Washington." "You shouldn't even be talking about impeachment until Mueller does his report, and you know you have grounds for it," said Bob Shrum, a former longtime Democratic consultant who was chief strategist to John Kerry's 2004 presidential campaign. "You should be talking about protecting Mueller, the culture of corruption which appears to go pretty far beyond Trump, and these basic bread-and-butter issues that people care about" like health care. Shrum and other Democrats said the political moment was reminiscent of the 2006 midterm campaign, when anger with the Bush administration's war in Iraq, botched response to Hurricane Katrina, and corruption scandals tarnished the GOP brand, resulting in a Democratic takeover of the House. But the party doesn't want to push its luck. Senate Minority Leader Chuck Schumer (D., N.Y.) warned Trump not to pardon his associates, and also argued the convictions were grounds to delay confirmation hearings for the president's Supreme Court nominee, Judge Brett Kavanaugh. And the House Democratic leader, Nancy Pelosi, told the Associated Press that if Democrats win control of the chamber, they should conduct oversight and ensure Mueller can complete his investigation. Impeachment, she said, was "not a priority on the agenda going forward unless something else comes forward." For his part, Trump on Wednesday accused Cohen of lying to prosecutors "in order to get a deal." Nevertheless, an anticorruption message is taking shape. Massachusetts Sen. Elizabeth Warren unveiled measures to ban former members of Congress from lobbying and to bar lawmakers from owning individual stocks. The Trump era has "given our country its most nakedly corrupt leadership of our lifetimes," Warren, a Trump foe and possible presidential candidate in 2020, wrote on Twitter on Wednesday. "But they didn't cause the rot – they're just the biggest, stinkiest example of it." The issue isn't going away. Manafort, who was convicted on charges of financial fraud Tuesday, faces another trial next month on separate charges stemming from Mueller's investigation into Russian interference in the 2016 election. That inquiry is ongoing and could well produce more indictments before the November elections. "It is a real issue for the Republicans to defend," said Rep. Brendan Boyle, a Philadelphia Democrat, referring to Tuesday's convictions and other criminal cases that have ensnared Trump allies. But as he campaigns for Democrats in tight races around the country, Boyle said, he will "primarily talk about the ways in which I believe working Americans are completely being shafted by Republican one-party rule in Washington." 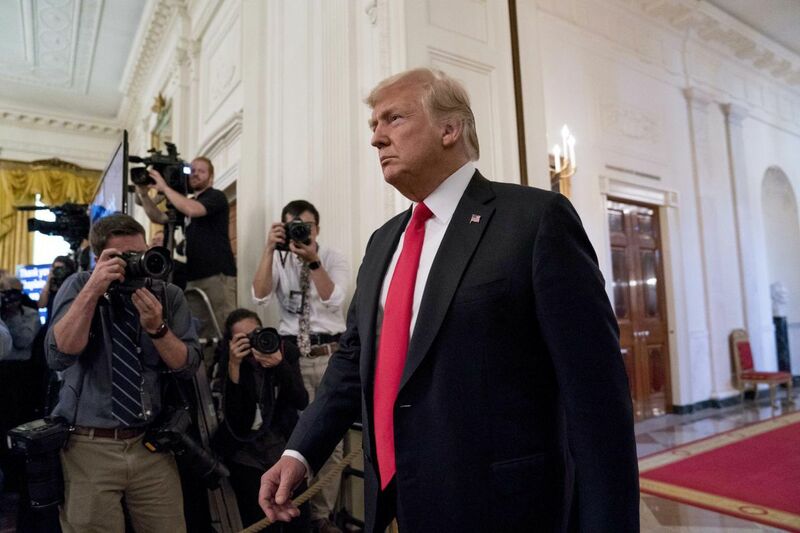 Mike DuHaime, a Republican strategist, said impeachment will be a campaign issue "whether Democrats try to make it one or not, because this seems to be in the news on a near-daily basis." "Democrats should be careful not to overreach on this," he said. "If they are seen as trying to overturn the election of 2016 without sufficient justification, the voters could push back on it, like they did in 1998 when Republicans voted" to impeach Bill Clinton. Former Trump strategist Steve Bannon has tried to frame the midterm campaign as a referendum on impeachment. "This other side, they're very motivated — and they're motivated for one thing: They want to impeach Donald Trump," Bannon told Politico last week. One race where Democrats may want to avoid a corruption debate: the New Jersey Senate campaign, where Democratic Sen. Bob Menendez is running against Republican Bob Hugin. A Quinnipiac University poll released Wednesday found Menendez holding on to a slim lead in the blue state. Regarding corruption charges that were ultimately dropped against the senator, 49 percent of respondents said they believed he was involved in "serious wrongdoing," including a plurality of Democrats. Just 16 percent of voters said he was not involved in serious wrongdoing. The poll found that ethics in government was the most important issue for voters in that race. Hugin has already spent millions of dollars on ads branding Menendez as corrupt; the senator rolled out his first ad this week. Menendez, filmed walking in his hometown of Union City, contrasted himself with the former pharmaceutical executive: "I'm standing up to Donald Trump. He donated hundreds of thousands to him."